How long does your quote stand for? A non refundadble deposit of £100 is required at time of booking. Full payment must be made 1 calendar month before the date of the wedding. Full payment is required if a booking is made with less than 30 days prior to the date of the wedding. Any additional changes to your requirements on the day may result in further charges. We accept payments by cheque and bank transfers. We will also accept payments by installments if required. If you need to cancel your booking we will need to know by email no later than 1 calendar month before the date of the wedding. Failure to do so may result in cancellation of the hire. Devon dub weddings reserve the right to withhold full payment if a cancellation if made with less than 30 days prior to the wedding. Our vehicles are maintained to a high standard, but classic cars because of their age do breakdown, in the event of a breakdown we will do our upmost to repair the vehicle as quickly as possible and if it is not possible to repair we will supply replacement transport but cannot gaurantee it will be a classic vehicle and a full refund will be given. A minimum charge of £100 will be made for any damage caused during the hire period including damage caused by illness. Devon dub weddings accept no responsibility for any loss or damage to personal property or luggage. Devon dub weddings reserve the right to refuse carriage of any person deemed unfit for travel and hold a zero tolerance policy in relation to aggresive or violent behaviour. The company reserves the right to charge the hirer a minimum cost of £100 for any breakages or spillages incurred to the vehicle whilst under hire. In the event of body or paint damage to the vehicles due to negligence by the hirer or hirer’s party, the hirer is liable for all repairs. Quote is valid for 14 days. Any changes to the booking after the quote has been accepted will incur further charges and payment must be finalised before service date. All reservations are only confirmed upon receipt of a non-refundable deposit of £100. Full payment for the hire must be paid one calendar month before the date of the hire. The failure by the hirer to do so may result in the cancellation of the hire. The company is unable to take responsibility for unforeseen conditions which may result in a delay or cancellation. These conditions include but are not limited to adverse weather conditions, mechanical/electrical breakdown or restricted access. If we are unable to provide an alternative vehicle for the hirer due to the unforeseen conditions stated above, a full refund will be provided. The company operates a strict no smoking policy in the vehicle. The hirer shall be responsible for the conduct of all passengers in the vehicle and ensuring that seat belts are worn where fitted. Extra journeys will be made on a best endeavour basis. No guarantee can be made to fulfil these extra journeys and the final decision rests with the chauffeur. These vehicles have no seatbelts as they are classic cars so any passengers, especially those under 14, travel at their own risk. We cannot be held responsible for any injuries caused through any accidents, be it our fault or a third party incident. The chauffeur will have the right to refuse to carry any passenger in extreme circumstances. These circumstances include but are not limited to drug taking, excessive drunken behaviour, lewd behaviour and aggressive behaviour. In the event of the vehicle being unavailable due to circumstances beyond our control, then as much notice will be given to the hirer as possible and if a replacement cannot be offered then a full refund , including deposit, will be issued. If our replacement vehicle is agreed to by the hirer then no refund will be given regardless of the difference in hire price. The company will accept no responsibility for any loss or damage to personal property or luggage whilst using our vehicle. All reservations are only confirmed upon receipt of a non-refundable deposit of £100. Full payment for the hire must be paid one calendar month before the date of the hire. The failure by the hirer to do so may result in the cancellation of the hire. Cancellations must be made one calendar month prior to the date of hire. Failure to do so may result in the hirer being asked to pay the full amount outstanding. 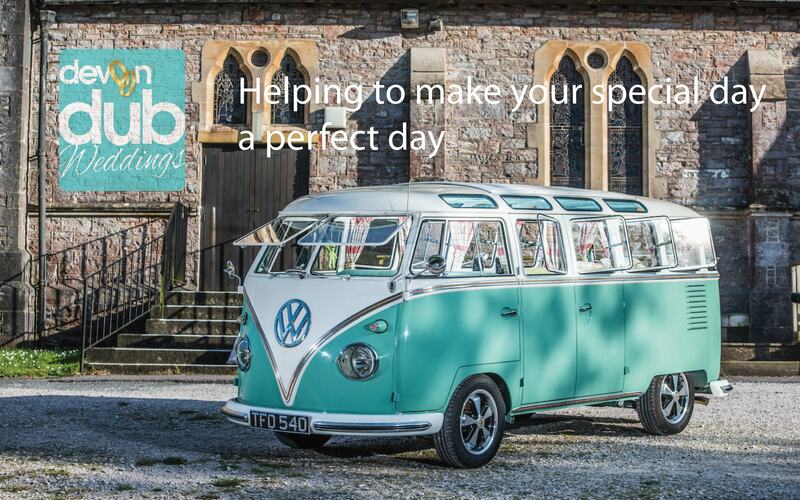 Devon Dub Wedding Car Hire - The premier fully restored VW Camper Van, making your wedding day perfect. Your personal data is safe with us, we do not collect email addresses forwarding them to third parties.